Another long hot day brings us to a campground east of Revelstoke. We had our best start yet, thanks to Linda's awesome hospitality, and were on the road by 7:00am. 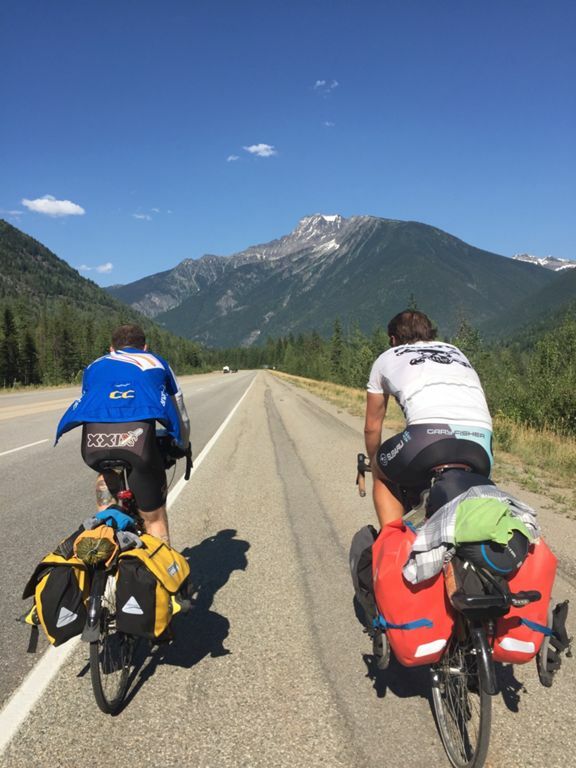 We rode 100km to Revelstoke for lunch. The morning was quite cool and flat so we made great time. We planned the next few days while in Revy and it became apparent that there was much mor climbing to come. With that in mind, Simon and I shipped home about 6-8 lbs of gear each. Mostly redundant stuff, and we may do another round after we get to Calgary, since the threat of very cold weather will be largely behind us. My knee is feeling better, and I feel stronger. A rest day would still be nice but likely won't happen for the next couple because we should be in a town for that, since it'll consist mostly of eating, stretching and bike maintenance, and it's hard to get a lot of food in a campground unless you carry it up there yourself. We had two of the hottest climbs today for sure, zero wind and about 38 degrees straight on our backs. Still zero sunburn for me. Early to bed, early to shred.